Splash pads have recently become popular family recreation destinations in cities of all sizes. While not meant to be a replacement to the pool, they offer a fun water experience while requiring a relatively small financial investment. For municipalities struggling with functionally obsolete and costly pools, splash pads are a smart alternative. They are scalable, allowing them to meet wide-ranging levels of service and budget. The jets and sprays offer an endless combination of choreographed movements, intensity, and sizes of water. Communities are implementing stand-alone splash pads, integrating them into existing pools and playgrounds, and including them in the design of new aquatic complexes. 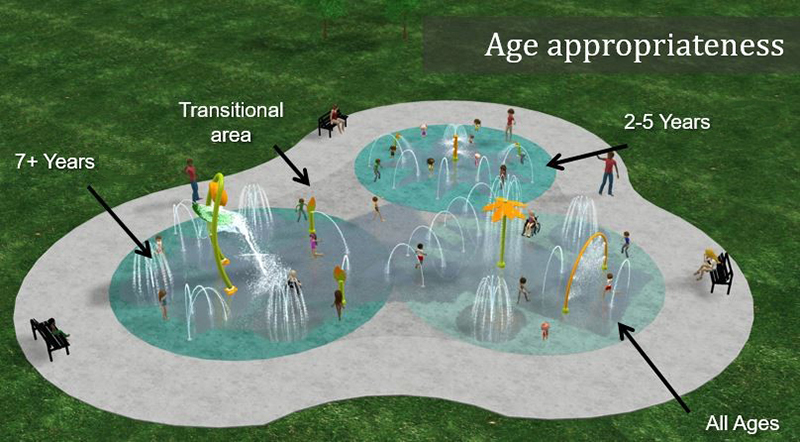 WHY CONSIDER A SPLASH PAD? Energy - Energize and liven up an urban or formal space with wet plazas and interactive fountains. These spaces attract visitors, acting as a focal point to an area. Efficiency - Co-location to existing park amenities provide further efficiencies including maintenance, parking, covered picnic areas, and restrooms. Revenue - Plan for adjacent pavilion rentals to foster use and revenue. Optional fees could fund operations, maintenance, and future expansion. 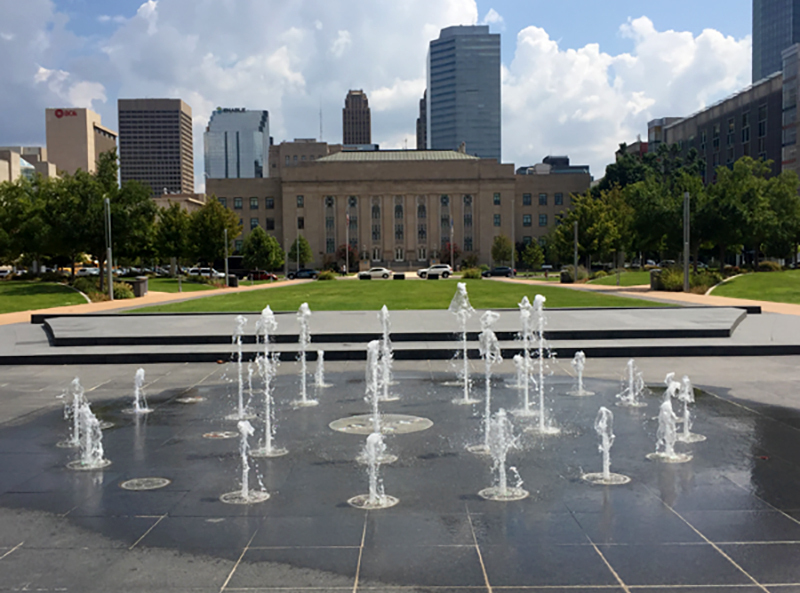 Interest - Universal splash mounting systems allow cities to periodically rotate spray fixtures, which can spark renewed interest and encourage return visits. ​​​WHAT ARE THE COST BENEFITS? 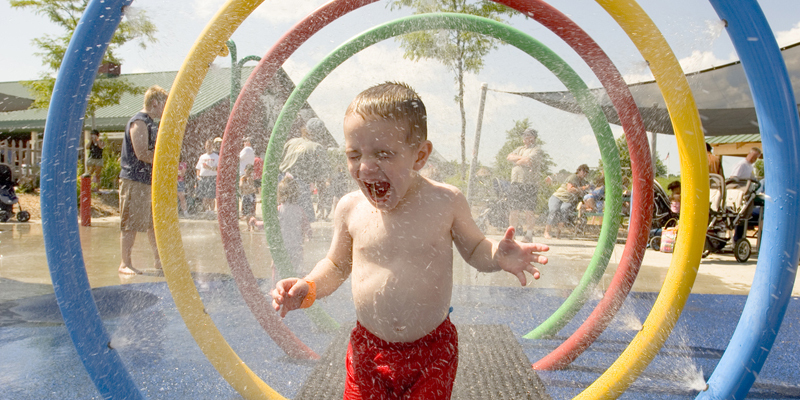 Construction - Initial construction costs for splash pads are much less than swimming pools. In addition, stand-alone splash pads do not require many of the security features found at municipal pools, such as fencing, gates, and administration facilities. Operations - The cost of operations of a splash pad are much less than that of a swimming pool. 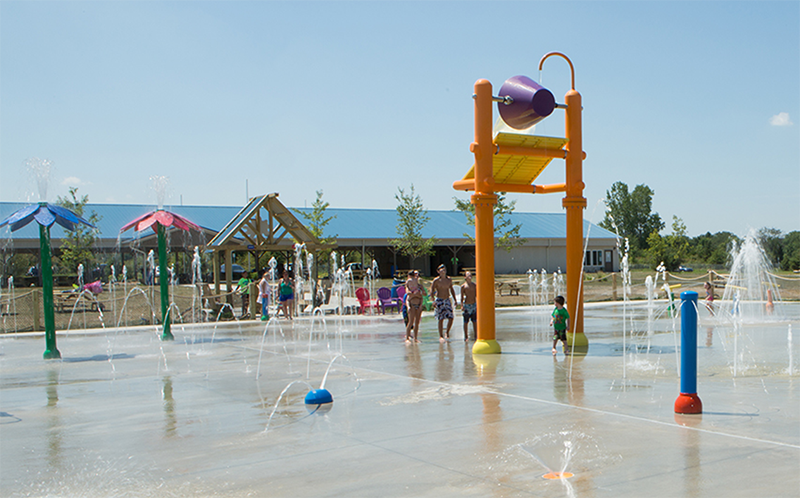 There are two main types of splash pad systems: recirculating and pass-through. The cost varies based on the type of system used. Recirculating systems collect the water within a holding tank where it is treated and filtered and pumps it back out again to the spray nozzles. This system requires scheduled water monitoring and adjusting of chemicals. While it uses much less water, it is more expensive to monitor. A pass through system uses city potable water and drains directly to the sanitary system and therefore no monitoring is required. The main cost is the potable water. Some systems collect the water and utilize it as a gray water application such as drip irrigation.​ If there is no charge to the residents to use the splash pad, access control personnel are not always required. Safety concerns, in general, are lower and do not require the hiring of lifeguard personnel. Maintenance – Once built, maintenance costs for splash pads are significantly less compared to swimming pools. Equipment operating costs are much less, especially in a pass through system that does not use pumps, filters, and chemicals. ​​​WHY ARE SPLASH PADS A POPULAR ATTRACTION? Interaction - Splash pads offer play environments that encourage interaction. Children can play impromptu games, blast water cannons, and anxiously stand together in anticipation of “the bucket” to drop its water from above. The versatility of splash pads with their multiple spray zones appeal to all age groups. Additionally, well-designed splash pads offer universal accessibility for all types of physical abilities. Safety - The pads have very little standing water, offering a safe environment in which children can play without the risk of drowning. There are many surfacing options beyond the traditional broom finish to concrete. Popular surface choices include fine aggregate particles added to the concrete finish, rubber mixed with resin applied to the concrete, and a poured-in-place rubber surface that offers a flexible and seamless surface. Design - Splash pads offer many design options. Coloring of pad surface and spray elements of all sizes, shapes, and colors allow for endless design and theming opportunities. These options can help a community tie into existing design elements, or create a new sense of place.